When I first heard of Project Morningstar, the conceptual title for DungeonScape, months ago my interest was peaked enough to engage. What I discovered then was a team of people who had an earnest love of gaming, excited about their future with the largest Tabletop Gaming Company out there. I loved the excitement and I’ve yet to come across a company as engaging as the folks over at Trapdoor Technologies. Initially, despite my enjoyment of their community involvement, I was skeptical that I would ever use their product. I’ve never been enamored with Character Builders much, I like paging through the books, and frankly I’ve never seen any digital tools put out by Wizards of the Coast that have earned much more than a “meh” from me. This was a third party developer though, a chance to do things right, so I stuck around for more information. I’m glad I did. I can’t lie and claim that being invited to the DungeonScape Press Invitational at Gen Con wasn’t a huge boost to my presence here on the net as a blogger about the games I love. It’s easily been the biggest thing that’s ever happened to my blog and I’ve since used the boost it gave me to garner more attention from the gaming companies whose products I wish to review, and to meet so many more great gamers out there. I think this all needs to be said because while I shall attempt to come across as unbiased as possible here, I want you all to know that I consider the people at Trapdoor Technologies friends, and really owe them one for picking a small fry blogger out of St. Louis to be one of their Gen Con reveal agents. I’ve spoken about what I saw at Gencon here on the blog of course, and from the tone of that article it is easy to see that I was excited. Given what I saw at Gen Con hearing that Wizards of the Coast has ended their relationship with Trapdoor Technologies is frankly baffling. In regards to the iOS they basically had a finished product, without the yet to be released books of course but still mostly complete. I felt the beta process was moving along well enough and we’d of likely seen a launch a little after the initial suggested launch dates but I’m not certain WotC is currently in the place to throw stones regarding delays. I really don’t get this move. 5e isn’t even done launching and Wizards is scrapping some promising Digital Tools that haven’t even made it out of Beta, hence the title of the post. Does WotC even know what it wants to do with a digital toolset? If it’s more of the same I’m out. If I get a sniff that they are going to try and hand us another lame subscription based Digital Toolset my eye-roll will make the locals think the New Madrid Faultline has finally quaked. I don’t want to be too harsh but the 4e digital stuff was largely crap and certainly not worth a monthly subscription. The stuff I saw Trapdoor Technologies presenting was great and I really hope I get to see some more come from them, but even they would never get a monthly subscription out of me. I stand by my earlier words that choosing a third party to handle the Digital Tools for 5e remains the best course WotC can take. Who knows, maybe they’ll surprise me, though I’m not holding my breath. I’m truly saddened by this and certainly wish everyone at Trapdoor Technologies the best, hoping madly that they end up creating some really cool stuff for me to use to enhance my games (damn I really wanted to see the Forge in all its glory!). If I were to conjecture my opinion would be that this split was over either the amount of 5e content that would be available within the tool and WotC may have been uneasy thinking folks would stop buying the books, or maybe they just really love that subscription based price model. I’m still going to support WotC because I honestly love 5th Edition and up until this point they have really seemed to have an ear to the community with the intention of making the game we want to see. This isn’t a death blow to the game at all, just a huge missed opportunity in my opinion. In Part One of this amateur study of the MBTI I spent a great deal of time on how this test could help a DM characterize the players in their game and how they might use the Types discerned in order to better run a game. 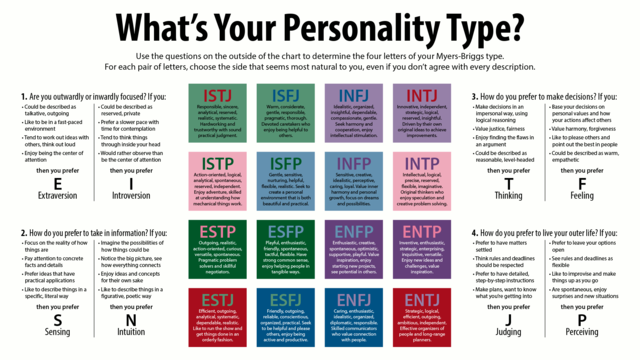 That use of the test actually runs a bit counterpoint to how many actually use the MBTI. In actuality, a more common method for using this test in today’s world is to take it yourself and get a better idea of where you fall along the scale. Once you discover your leanings it is a common strategy to use that knowledge to better understand yourself and where you preferences lie. Once you know these it may help you to understand why you don’t work as well with a certain other type. Going even further, you can use this knowledge to know where you might strengthen yourself too. I would like to posit that games like Dungeons and Dragons, and other Tabletop RPGs, are very strong methods for training up a Type or Preference you don’t commonly adhere to. People often call D&D an “Escape Mechanism” but what if it can be more than a simple release from your troubles in reality? What if spending time “in-game” as a different persona can be used to help, say, an Extrovert better understand how to think as an Introvert? Businesses spend tons of money on team building and training every year trying to get a group to work together. In fact, this entire two-part blog post stemmed from a leadership training I undertook where we had ourselves evaluated using the MBTI with the intent to help us better understand ourselves, coworkers, and to finally point out areas we might wish to “improve” ourselves in. Games in general sometimes show up in these types of training endeavors. Typically they might be games that rely on teams to work together to solve problems or even learn to trust each other. Is any og this sounding a mite familiar?This is why I think RPGs could be great training tools in the business world in general. You have groups work together to solve problems all the time in RPGs, and you certainly have to learn to trust one another to make sure you all get out of dangerous situations in tact. I could go on about my desire to one day start a team building franchise where businesses have their employees play Dungeons and Dragons for a day but I’ll get back to the point of this post instead. I’m talking about growing yourself on a personal level by playing D&D. By pinpointing where you excel along the MBTI you can also see where you may have difficulties relating to others who fall along much different paths. If you have the desire to practice acting in a manner contrary to your typical type, it can be as easy as rolling up a character much different from you yourself. WHO SAY I CAN’T ALSO BE THE CHARISMATIC LEADER!?!? An easy example to use would be for introverts. 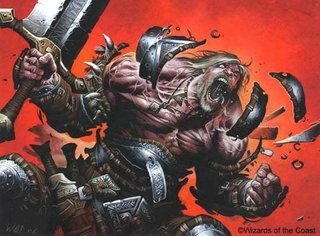 This time around try being the party’s charismatic leader for a change, or maybe the loud brash Barbarian who wears his\her feelings on the…errr loincloth. By being vocal and extroverted in the game it may make it easier for you to swim in those circles in real life. Of course that doesn’t suggest you’ll change to being an extrovert, or even that being one or the other is preferable, but rounding yourself out as a person can certainly be a benefit. As a fun practice, maybe try to think of your own examples of characters to play that could satisfy a little growth in another direction. If you wish, lay them on me down below in the comments. I always love to hear from you all! Take care folks, hope you’ve enjoyed this aimless blathering of my interpretations of the MBTI! Wizards of the Coast has not been idle. Granted, I think we would all like to see the third Core rulebook in our hands but that doesn’t mean we’ve a lack of content. 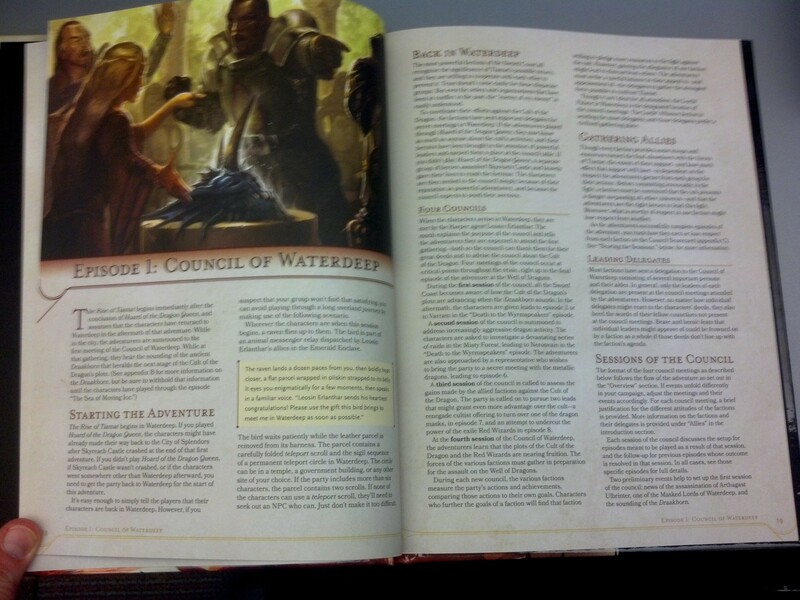 The team up with Kobold Press to produce campaign content for 5th Edition D&D has certainly been of epic proportions. 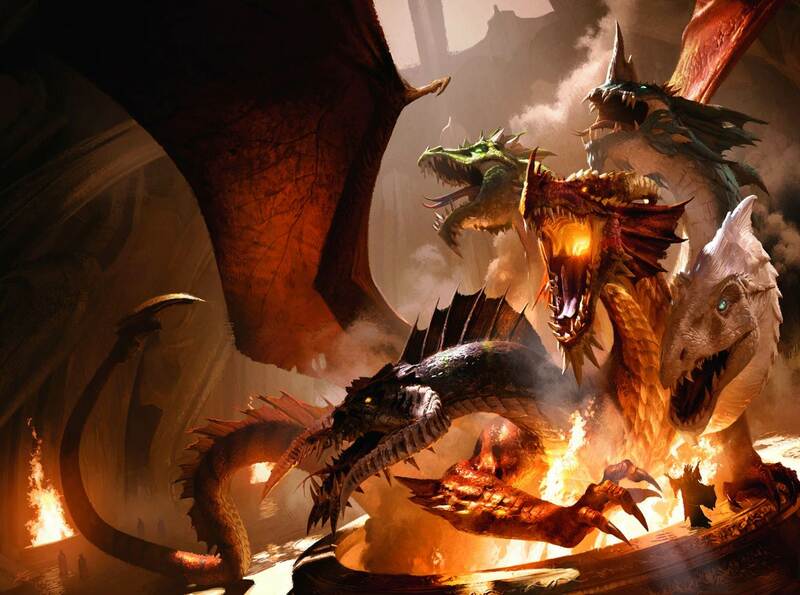 The Rise of Tiamat comes to us as the second piece of a puzzle, the first being the popular Hoard of the Dragon Queen, designed to take characters from first level to fifteenth and all up and down Fearûn’s Sword Coast while doing so. I had occasion to speak with a local Game Shop owner the other day and I inquired how organized play (D&D’s Adventurer’s League for which this campaign arc is made for) was doing under the new system. His eyes lit up and he revealed that things were going really well. Under 4th’s Encounters he said he had roughly 3-4 tables but currently he’s been seeing just around double that number of players. Interest has been sparked and looking at the quality of this book it is easy to see why. I’ve already spoken to my love for the new systems’ rules and lore but this is the first time I’ve gotten my hands on some prewritten adventure work (I never got the chance to look at Hoard of the Dragon Queen sadly) and I’m liking what I see. I haven’t yet had a complaint about the physical quality of any source books produced by WotC in this edition and I’ve none here. This is the first time I’ve been able to comment on the layout of an adventure however, so I took my time digesting that. Glossy in the front, textured in the back. Like the other books we’ve seen thus far the new book’s binding feels strong, sports a glossy cover, and a textured portion on the back that I’ve come to really like. Grabbing a book and feeling that texture just feels right to me in a way that a full on glossy book would not. I’m not certain who decided to add that small piece to the craft of these books but I’d like to thank them. I know it may seem odd for me to spend a lot of time remarking on such a small addition, but I really do like it! We aren’t looking at a small book as far as prewritten adventures go, it’s a fair size bigger than most. Considering the plot intends to take characters from level 8 to level 15 before they finish things up I’m certainly not surprised at its girth. Lastly I’m a big fan of the type of paper utilized. It has a heavy, textured feel to it that glossy paper just can’t compete with. Finding your way around the pages of TRoT won’t be too difficult. The table of contents does a great job of not only pinpointing key episodes but it also lists out key events within said episodes. The Appendix’s are helpful for certain points in the game and the only thing truly lacking is a good index. It could be argued though that an index isn’t as necessary in this kind of book. The artwork in The Rise of Tiamat holds up with the quality we’ve seen in this edition easily. The cover is adorned with a Hellish scene of Tiamat herself being summoned into the world of Fearûn, ready to wreck havoc with its poor souls. The only complaint I could have with the artwork is the lack of it. In reviewing the recent core books I’ve been bombarded with gorgeous artwork on damn near every page but here we see more “walls of text” than pages with art. I’m not sure why this is the case either, the book is big for a premade adventure book but after seeing the sheer mass of the Monster Manual I know we can go bigger…much bigger. Why not add just a few more pages to add more imagery? I spoke about the book being easy to meander through in the above paragraphs and I did mean it. A Dungeon Master, albeit an experienced DM as this is not all that approachable for a newbie, will find the storyline logical and fun to work with. We are cautioned about party size and how to adjust for more or less than the recommended party of four and there is even a bit of a reminder that certain NPCs are intended to re-occur. If your group killed said NPCs there’s a suggestion that having those NPCs raised from the dead may actually drive home just how vast the resources of those the players are up against might be. 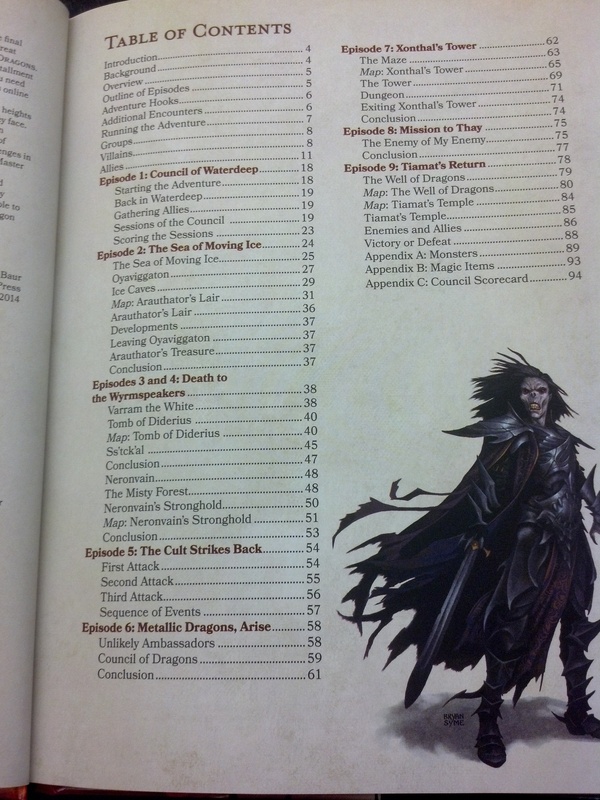 A small annoyance I ran into was the many references to Magic Weapons not actually availiable to us yet, what with the D&D Dungeon Master’s Guide not showing up until December (presumably), but I imagine we will see some sort of excerpt from WotC detailing these like we did with Hoard of the Dragon Queen. Not only useful, this tool could also be used as a form for creating your own factions. Things still take place along the Sword Coast and as the players have “grown up” from their experiences in Hoard of the Dragon Queen they are now working with various factions interested in the similar goal of protecting the Sword Coast. 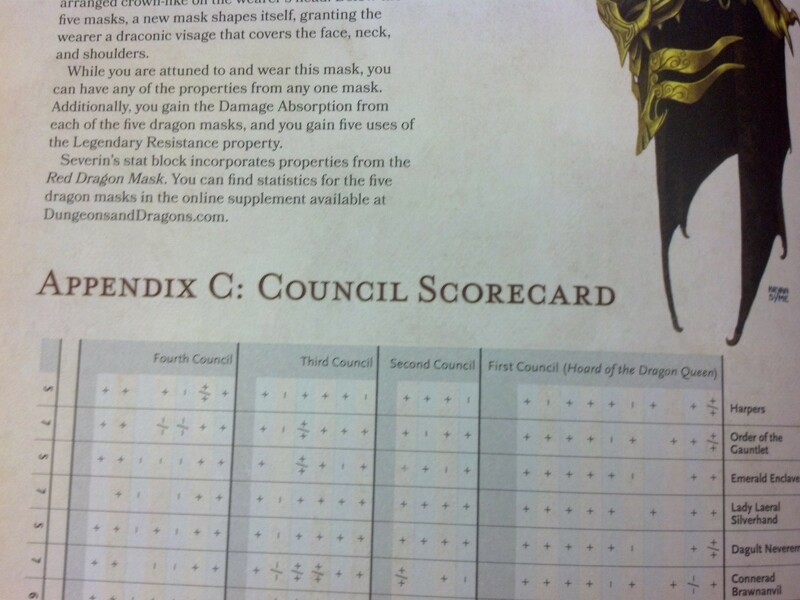 One of the neater additions to the campaign is a reference tool for the DM called the Council Scorecard. The DM can use this to measure the actions of the Players against the Council in order to see if they have either curried favor or caused mistrust with certain groups. It is plain to see that a little bit of advanced role-play may be necessary as the levels rise. As with the mention of needing an experienced DM it seems players may need to be fairly experienced as well. Things seem a mite tougher in this edition’s organized play than what we saw with Encounters. Players themselves will gain levels via a completion style rather than by adding up experience points. This seems not only fair but very useful to me. You’ll need those players to be a certain level prior to the big finale, it holds nothing back. Tons of useful, and flavorful maps adorn the pages. On the whole this entire campaign arc seems to be on a very grand scale. 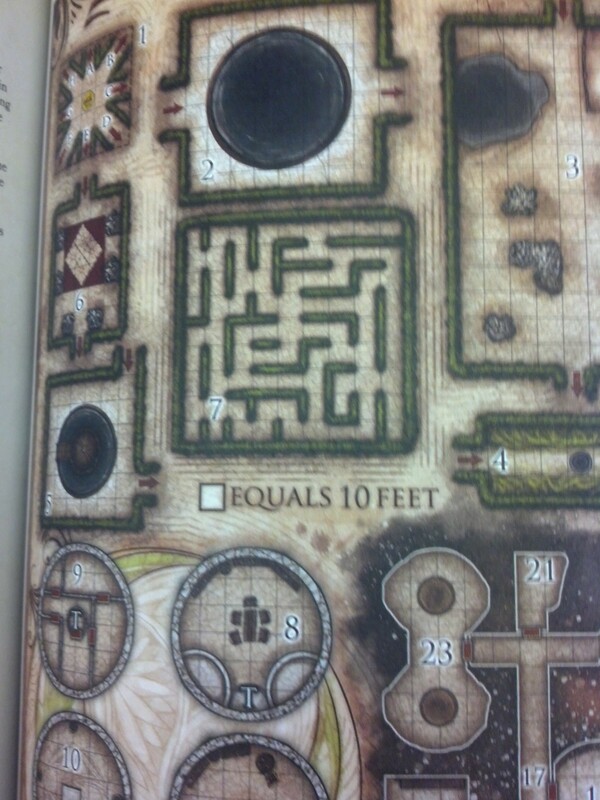 Even if you don’t plan to run the game there are certainly useable details in this book, and presumably HotDQ (now I want that book too) as well. 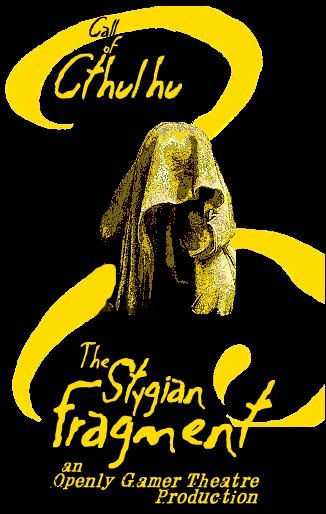 If you’re looking for a premade adventure to introduce yourself and/or your players to 5th edition and Fearûn I can’t speak highly enough of the quality here. It doesn’t seem to work well as a standalone book, but I don’t think that was ever the plan, you should really have HotDQ if you plan to run the campaign. I would say you could use adventure arcs from within as standalones with some minor tweeks though. 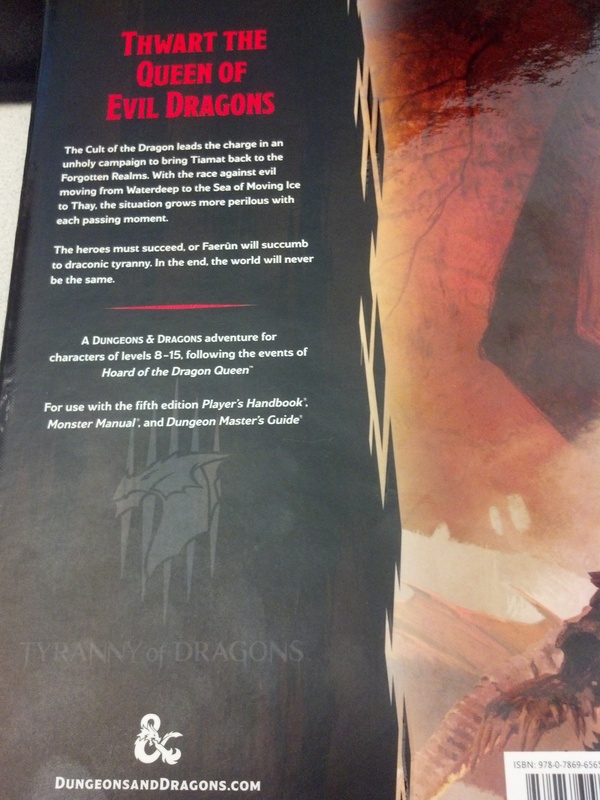 WotC‘s progress out of the gates of this new edition continues to be pretty strong, despite the setback with the DMG. I know I’m hungry for more and seeing the time and care they and Kobold Press put into this product only makes me hungrier. Also, kudos on the funny little disclaimers I’m seeing in every book. Love those! We are 2/3 of our way to a complete collection of core books for the 5th Edition of Dungeons and Dragons. 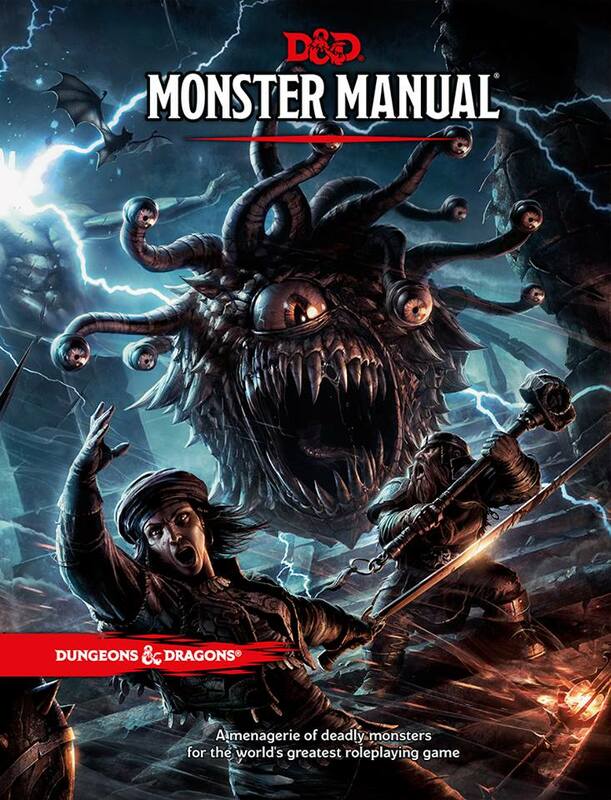 If you read my review of the Player’s Handbook you could easily tell I was gushing over the product and my review of the Monster Manual will likely show that the second core book instills the same level of adoration for this edition in me. 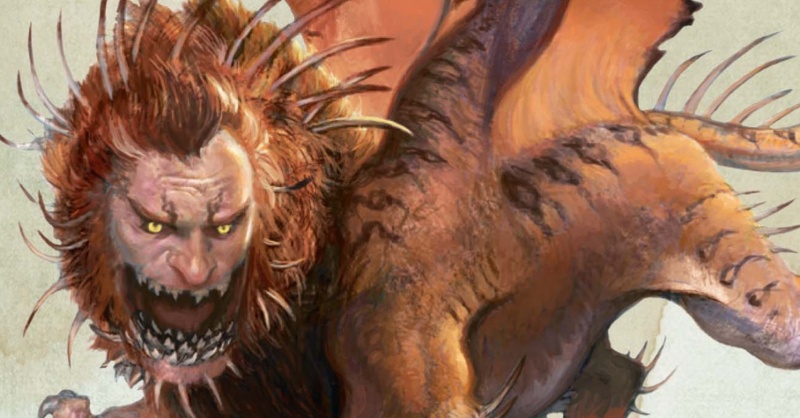 What I have before me is a solid catalog of rich creatures to pull from to flavor a world. The book is massive, and it contains so many of the iconic creatures we’ve loved over the years. The cursory read through I’ve done for this review will certainly be one of many. The book itself is solid and huge. So many monsters have been shoved in this beast that I’ve heard some wonder about whether we will see binding issues in the future, so far I’ve seen none. I can say I’ve flipped through every page and haven’t had an issue with even one of them, everything is nicely knit into the body of this manual. 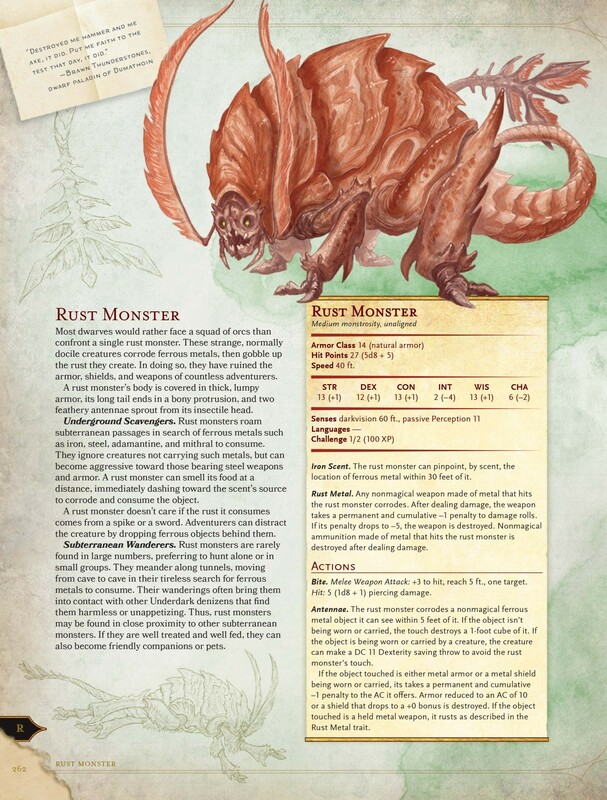 I’ve really become enthralled with Rust Monsters in this edition. My players are going to be so very annoyed. I thought the artwork in the Player’s Handbook was gorgeous, and still do with few exceptions, but the Monster Manual outpaces its predecessor easily. Perhaps it’s just because a bestiary ends up being a feast of work for artists, I’m not certain the reason, but it just seems wonderfully drawn and inked. With a Monster Manual it can be easy to follow a formulaic approach to pictures of the creatures, but we certainly don’t have that here. Artwork varies from large splash pages to smaller corner pictures that always brings to the fore what’s important about their appearances. Truly some great art direction is evident. There was an approach to this editions’ monsters that truly humbles me. I have caught little snippets of information about certain creatures that smacked of their iterations through the years across the board. The team behind the book obviously poured over older editions and supplements to grab the best of the best when it came to the lore surrounding the additions to the manual. The notable standout addition to lore lies with terming certain creatures “Legendary”, and with that keyword comes extra benefits such big baddies can pull from to challenge players. Legendary creatures get these things called “Lair Actions” that occur on a certain initiative count and can do some serious work. Earthquakes, Stone Spikes emerging to harm players, or even Freezing Fog can add some extra difficulties. I also love how these Legendary Creatures get some Regional Effects as well. Now, Regional Effects could certainly be something an intuitive DM might come up with on their own, even I came up with the idea of a Red Dragon’s surrounding land being somewhat blighted by ash, but the addition of some actual rules and ideas for what to use for these creatures will be nothing but helpful. The Stat Blocks are easy enough to read for anyone who’s done this before but I can’t say they’ll be all that approachable for a novice. It can be a bit jarring at first to only have numbers for skills or saves a monster is actually proficient in but given enough time handling that will be easy enough if you just recall what stat handles what save/skill. Monsters are given a “Challenge” number meant to indicate what level a party of four to five PC’s needs to be before having a fair go at it, and if you feel you need to brush up on how to parse these numbers into fair encounters and XP my buddy Scott actually made a very informational video about it. Here’s the Link. It’s 40 minutes long, because Scott is not one for being light on content, but well worth the watch. Look. 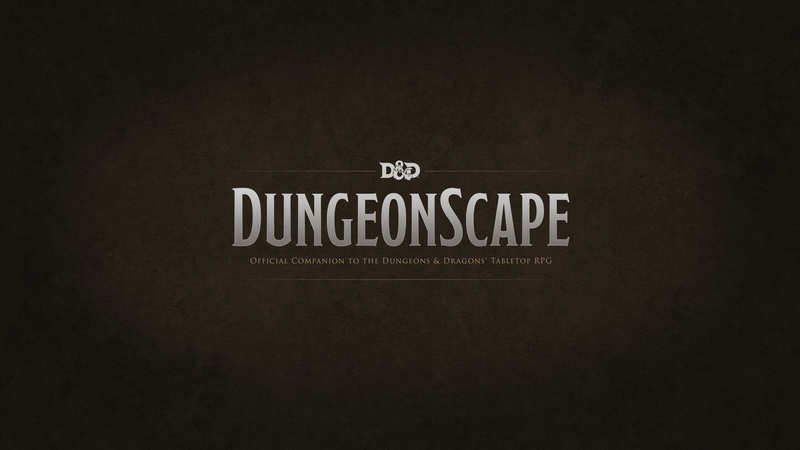 If you’re going to run a 5th edition D&D game, you’ll need this book (or perhaps the DungeonScape download of its contents, but I’ve yet to see those). Most anyone who’s interested in D&D 5th Edition will want it anyway so one might ask what use my review is in the first place. 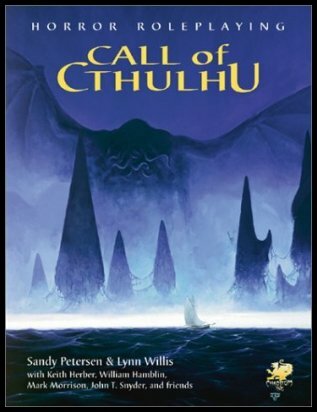 Well, I can say that even if you aren’t a big D&D person there’s lore abounding in this book for some very iconic creature to be used in any RPG. Pick itup, it’s beautiful. You won’t regret the purchase no matter the RPG you frequent. One of the key missing items in Privateer Press’ Monsternomicon for the Iron Kingdoms RPG is an index that lists them by their Encounter Point rating. To allieviate that issue, I’ve created one for us all to use. Clicking the title will give you a copy of the Excel Spreadsheet I used to make it as well. to look at some of the RPGs I’d brought along and it got me thinking of the reason I’d been invited in the first place. I had reached out to the library months before inquiring whether I could set up a monthly Game Night where, ideally, those who didn’t have a place to game, or had never experienced Tabletop Gaming, could come and play\check things out. So I decided to speak with the Teen Outreach representative to see what we could set up. The end result is not originally what I had in mind, since I had no idea what to expect with all this. I think it is better though. Now I’m focusing solely on Teen Outreach with Tabletop RPGs rather than just anyone who wants to walk in. I think if I can reach anyone to teach them this style of gaming I love, I love that it’s kids. It’s when I was first introduced to the game and it has certainly stuck with me. Yesterday marked the second night I’ve put this on. So far I only have two kids that are repeat attenders (apologies for that play on words) but they seem eager to play and have expressed a lot of interest in returning. I’ve been having a lot of fun running the D&D 5th Edition Starter Set’s adventure “The Lost Mine of Phandelver” for them. Hell, they’ve actually made it to the town of Phandalin, which is more than I can say for any of the other groups I’ve run it for. They are a brother and sister and for two kids who have never played any kind of Tabletop RPG they’ve picked up on things quickly. Their play style has been cautious, as there are only two of them, and it has been paying off. One of my favorite moments from last night’s game was when they snuck up on the big Bugbear leader in the first cave and the sister let loose some Burning Hands, more than halving his hit points, only to have the brother stroll in and clobber him across the head with his warhammer. The Bugbear never even got to swing his Morningstar. Another cool tidbit was their decision to bring the few goblins they left alive and their Bugbear leader back to town with them as prisoners. This netted them some reward money that wasn’t strictly written into the adventure but I thought was well deserved for thinking to bring these brigands in for a “fair” trial. I do think I’ll allow the punishment to the goblinoids to be dolled out off screen though. Even if I’m only an advocate for the game to them I’ll mark it as a win. Two more brought into the fold. Though, of course, I’m hoping for more. If nothing else this may serve as a challenge to you all out there. Perhaps their’s a library near you that might let you do something similar! Give it a thought, teaching others about this game we love can be very rewarding. I speak from experience!